The New Schnauzer & Schnauzer Cross Agility League was started by Jo Plevin in 2014. She had been competing for a couple of years with her two Schnauzers Sparkle (G6) and Rolo (G5) and noticed more and more Schnauzers and Schnauzer crosses at show. As the previous Schnauzer League was no longer running, she decided to set up her own! 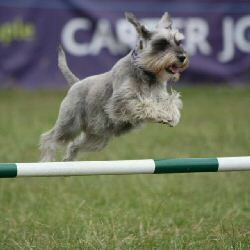 The new Schnauzer & Schnauzer Cross Agility League is now up and running and ready to take members. All sizes are welcome. I am doing it purely for fun and hope that members view it the same way. I am relying on members' honesty when they submit their results. The League will run from May 2014 – April 2015. There will be a fee of £3.00 per year per dog to join the League. The money will be used to fund rosettes for each grade winner. If there are enough members, 2nd place will also be awarded. Smalls and Mediums may be split depending on the number of members. There will also be Anysize which will include new competing dogs, dogs recovering from injury and veteran dogs. If you enter your dog in Anysize, it must stay in Anysize for the remainder of the League Year. You cannot move from Anysize to grades. Dogs will stay in the same grade for the duration of the League Year, irrespective of any win out. The dogs will then need to be moved up the following League Year. Points may be claimed for all Kennel Club and non-Kennel Club shows. You have two weeks to submit your results or points will be lost. Final results must be submitted by 15th May 2015. Points cannot be claimed for Teams, Pairs, Pay on the Day classes, interclub matches or Champ classes. If you would like more details of the Schnauzer & Schnauzer Cross Agility League or want to join the League, please email jo.plevin@ntlworld.com. There is also a Facebook page where you can see your results, chat to fellow Schnauzer and Schnauzer Cross owners, swap training tips, post pictures and videos and celebrate wins. 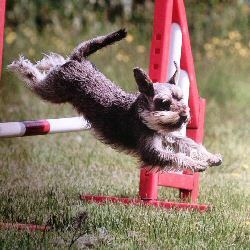 Just search Schnauzer & Schnauzer Cross Agility League. Results will also be emailed out monthly.